Above are two story maps you can use to write your holiday stories. Stories can be be fiction or non-fiction (true). For example you could write a story about an elf (fiction) or you could write a story of how you spent the holidays last year. They should be no longer thatn 1 page. Include story title, Authors name and class and grade. Goodluck to all my wonderful writers. The story starts aboard the Susan Constant two boys meet Jeremy a boy who’s family owns a shipping company, and Anthony a beggar boy from the streets of London. The year is 1607 and they are both headed to the New World. The London company is paying for the voyage. It is more than 100 years since Columbus “discovered” the New World for Europeans in 1492. Since that time, people from Spain, France and England have sent explorers to the New World ( North America and South America). Everyone wants a piece of the New World for themselves. The Spanish have started colonies in Florida and South Carolina. Also just like Columbus they are hoping to find a shorter way to China. This time by finding a river that cuts through North America/South America and takes them to the Pacific Ocean and on to the Indes. The English want to start Colonies as well. These two boys 15 years old we tell us the story of this Colony. So far we have met Master Wingate an important man from the London Company, and Captain John Smith, a soldier who gets arrested aboard the ship for mutiny. The charges are dropped. We also met his page boy Samuel, a boy some years younger than Anthony and Jeremy. Protected: Take Survey here… you need the password! November 18, 2009 | Categories: Uncategorized Stuff | Enter your password to view comments. What was the most important event in U.S. history? Was it the Pilgrims� landing at Plymouth Rock? How about the American Revolution? Or was it the Civil War? It�s hard to decide. They�re all important. Yet the founding of Jamestown may have been the most important. After that, everything in America changed�even worms. You�re probably wondering what worms have to do with history. We�ll get to that later. First, we have to learn about Jamestown. You may think you already know about Jamestown. You may have even seen a movie about it. Well, the real story is very different. So let�s burrow into the history of Jamestown. 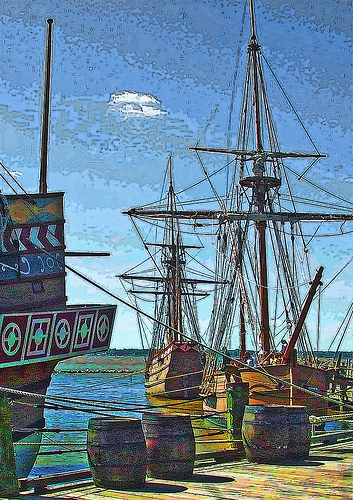 On May 14, 1607, three ships full of colonists came to shore along the banks of the James River in what is now Virginia. The people on board had sailed from England to found a new colony. They called it Jamestown. The colonists couldn�t have chosen a worse place to settle. It was marshy and filled with mosquitoes. There was little drinkable water. Worse yet, the area was in a drought. They also faced other hardships. They had to protect themselves from two enemies. First, they were fearful that ships from Spain would attack them. England and Spain were fighting each other at that time. Second, they were afraid that a Native American group, the Powhatan, would attack them. To protect themselves, the colonists built a fort. It was triangle-shaped. Inside the fort, the colonists thought they would be fairly safe. They were wrong. The new environment threatened the colonists even more than the Native Americans did. Indeed, it nearly wiped them out. The drought caused many hardships. Water was scarce. Crops wouldn�t grow. Animals couldn�t find plants to eat. The colonists were often hungry and thirsty. Out of food, the colonists started to eat anything they could find. They wolfed down cats, dogs, horses, and rats. They even boiled starch from some of their clothes to make a thick soup. Still, they starved. Nearly two years after the colonists founded Jamestown, they decided to head home. Worn out, they loaded a ship and got ready to leave. In the nick of time, supply ships arrived. The colony was saved. Things now started to get better for the colonists. More colonists moved from England to Jamestown. One of them was a man named John Rolfe. John Rolfe settled in Jamestown three years after the colony had been founded. Things were finally starting to look up. Soon the drought ended. Things continued to get better. In 1614, Rolfe married Pocahontas. She was the youngest daughter of Chief Powhatan, the leader of the Powhatan. The marriage brought peace between the colonists and the Powhatan. 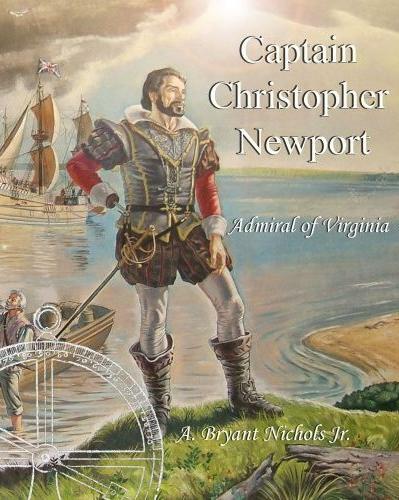 Rolfe also got a shipmaster to bring tobacco seeds to Jamestown. Before long, the colonists were growing and selling tobacco. A plant grown to be sold is called a cash crop. More and more people moved to Jamestown. Many wanted to come. Others were forced. Kidnappers brought people from Africa to Jamestown. There they were forced to work. After a few years, some of these Africans were freed. Others remained slaves. Slaves worked in the tobacco fields. They built houses for their owners. They did much of the work to build the colony. Yet they were never paid. For them, Jamestown and America did not offer a better life. The colonists changed the land around Jamestown in many ways. For starters, they cut down forests and grew crops. The colonists also brought new animals and plants to America. Domestic cattle, chickens, goats, horses, and pigs all made the journey to Jamestown. None of these species lived in the Americas before the colonists brought them. Some of the smallest alien animals brought by colonists made the biggest changes. Take worms and honeybees, for example. Before 1607, worms didn�t exist in some parts of America. Nightcrawlers and red earthworms didn�t crawl through the soil. These tiny worms made big changes. They ate leaves that littered forest floors. Those leaves fertilized and protected the soil. Without the leaves, rainwater washed away nutrients. That made it harder for some native plants to grow. While worms made it harder for some native plants to grow, bees made it easier for some alien plants to take root. Busy bees helped pollinate watermelon, apple trees, and peach trees. Without bees, these plants would never have survived in America. The Jamestown colonists weathered some tough times, but they survived. 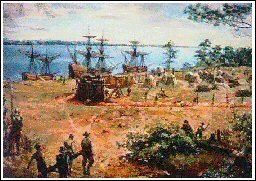 Jamestown was the first English colony to succeed in America. More colonies followed. The people in these colonies changed the land in many ways. So did the plants and animals they brought. Together, these colonies, plants, and animals helped make America what it is today. Take the Test on Jamestown! Use your username to sign in! The colony was sponsored by the Virginia Company of London, a group of investors who hoped to profit from the venture. Chartered in 1606 by King James I, the company also supported English national goals of balancing the expansion of other European nations abroad, seeking a northwest passage to the Orient, and the creation of settlements in the New World. Made up of townsmen and adventurers more interested in finding gold than farming, the group was unequipped by temperament or ability to embark upon a completely new life in the wilderness. Among them, Captain John Smith emerged as the dominant figure. Despite quarrels, starvation and Indian attacks, his ability to enforce discipline held the little colony together through its first year. His rule was for these people that were not used to doing physical labor, no work – no food. In other words you had to work to eat, if you refused to do your share you would not be fed. In 1609 Smith returned to England, and in his absence, the colony descended into anarchy. During the winter of 1609-1610, the majority of the colonists succumbed to disease. Only 60 of the original 300 settlers were still alive by May 1610. The years between are know as “Starving Time”. The initial small group of 104 men and boys chose the location because it was favorable for defensive purposes, but it offered poor hunting prospects and a shortage of drinking water. Although they did some farming, few of the original settlers were accustomed to manual labor or familiar with farming. They failed to plant crops early enough to ensure a successful harvest. Hunting on the island was very poor, and they quickly exhausted the supply of small game. The colonists were largely dependent upon trade with the Indians and periodic supply ships from England for their food. At Jamestown, a drought earlier in 1609 during the normal growing season had left the fields of the colonists of Virginia barren. Between the lack of trade with the Indians, and the failure of the Third Supply to arrive with expected supplies, the colony found itself with far too little food for the winter. With the new arrivals, there were many more mouths to feed. Faced with impending disaster the colony attempted numerous attempts to break the Powhatan siege with armed foraging expeditions, diplomatic expeditions, and trading expeditions. All attempts were beaten back by the Powhatan’s, with most of the expedition personnel captured or killed. 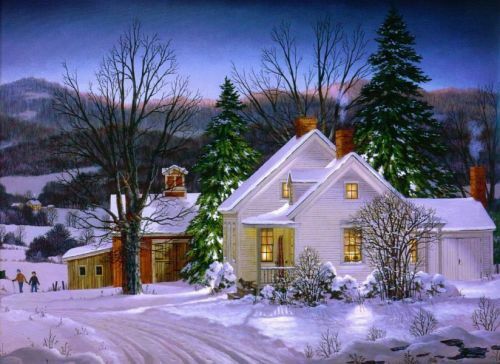 There are few records of the hardships the colonists experienced in Virginia that winter. Arms and valuable work tools were traded to the Powhatans for a pittance in food. Houses were used as firewood. Archaeologists have found evidence that they ate cats, dogs, horses, and rats. In early 2007 at least three respected authorities concluded, based on some credible evidence, that the starvation conditions were so severe that corpses were dug up, and human flesh was eaten. There are 3 reasons that people from Europe came to the New World. 2 to be free in terms of religion. 3. to work for other people as slaves or indentured servants. There is actually a 4th reason: For Adventure. clear to White that he would have to get more supplies. White to make the trip back to England for the supplies. 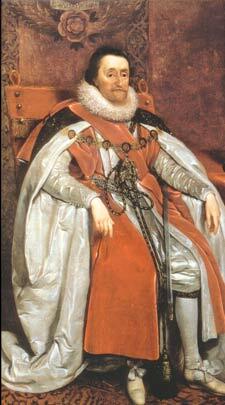 He departed for England in the late summer of 1587. England because of the attack of the Spanish Armada.